Hello to our new stockist in Bakewell, Derbyshire. 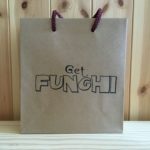 We’re delighted to welcome another lovely cafe/deli to the Get Funghi family. 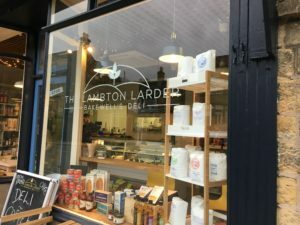 The Lambton Larder opened recently on Buxton Rd in the busy market town of Bakewell. It stocks a small but well chosen range of ambient and fresh deli products, and serves tasty food and drinks at lunchtime. We wish them all the best for their new venture! 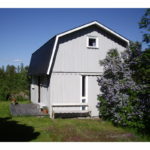 Planning a tasting there in April, details to follow soon. 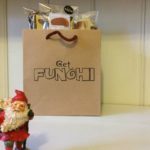 If you’re looking for a present for the foodie in your life, or a Christmas treat for yourself then why not get a Get Funghi gift bag. 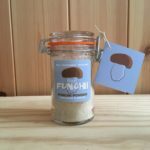 You can either pick them up from us at home in New Mills or we can post them to you for £3.50 p&p. Message us on Facebook, Instagram or Twitter, or email us using the contact form on this website with your order. 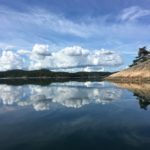 We enjoyed our traditional August in West Sweden catching up with family, having some holiday, and picking porcini and other ceps to last till this time next year. 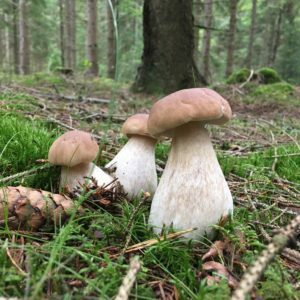 It was another bumper year for these mushrooms over there and reports suggested it was the same in many other parts of Europe. Now we’re back in the UK for the foray season and are looking forward to our first one of the season on Sunday 16 September. A late cancellation has freed up a couple of spaces so do get in touch if you are interested in coming out with us in the beautiful Peak District. Other events coming up in Derbyshire are another tasting at High Peak Food Hub in the Butterfly House at the Torrs, in our home town of New Mills, this Thursday 13 September from 5.30-7.30. There’ll be lots of other local food producers showcasing their delicious goods and you can get a drink from the bar as you mooch and buy, so its well worth a visit! Following that we will have a stall in the Food Marquee at the Hayfield Show on Saturday 15 September. It’s our first time there as producers rather than punters and we’re looking forward to being part of this fantastic country show which has been a September highlight for us for many years. We’ll be doing our annual foray for New Mills Festival which this year is operating as a Fringe Festival, on Sunday 23 September. There are still places available and all details of this event and others can be found on the website of this wonderful festival, entirely run by volunteers. Last but not least, we’ll once again be running a pop up Swedish cafe at Made in New Mills arts and crafts sale, at Providence Hall in New Mills, on Saturday 29 September from 10-4. This is a real gem of a show with the creme de la creme of artists and makers from this area, celebrating its 10th anniversary this year. 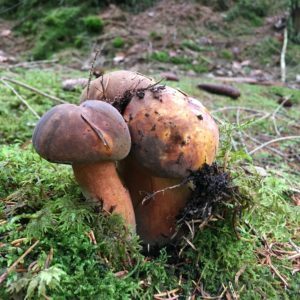 Oh and I’d almost forgotten, we’ll be leading another Peak District foray with lunch al fresco the day after, Sunday 30 September. There are a couple of spaces available on this date and several more on our final one on Sunday 21 October. Full details are on our UK forays page. Long, hot, dry summer followed by substantial rain = mushroom explosion! 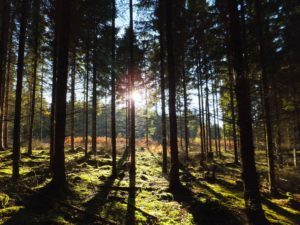 It’s all happening in the woods of West Sweden and we’re out every day making hay while the sun shines, as it were. 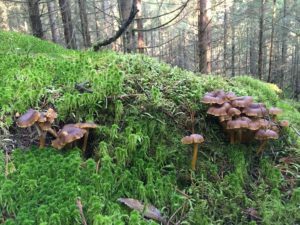 It’s lovely to see water trickling in the stream beds and see the undergrowth getting greener again, and even lovelier to see the forest floor blooming with more and more wild mushrooms every day. We’re really looking forward to our longer forays with lunch al fresco in the Peak District. 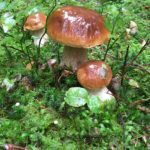 Going out with other mushroom enthusiasts is always one of our favourite activities. The first one is now fully booked but we still have spaces on 30 September and 21 October. You’ll find full details on our UK forays page. Coming up also is our traditional foray for New Mills Festival, which this year is running in a smaller format as a fringe festival. 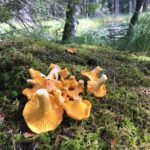 Join us for a walk around the fields and woods, with a wild mushroom soup to taste in a pub afterwards, on 23 September. We’ve got another stockist! 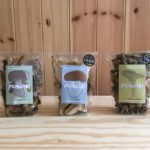 You can now buy our mushrooms at the new Whistlestop Cafe/deli run by the Derbyshire Wildlife Trust in Matlock Bath. 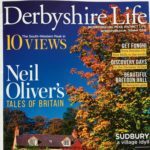 All proceeds from sales there will go towards the invaluable work they do supporting wildlife in Derbyshire and encouraging us all to get out in the countryside more. 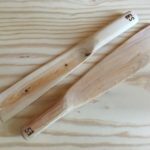 As folk who spend a lot of time outdoors in the wild we wholeheartedly support their ethos so we’re extremely glad to be stocked there. 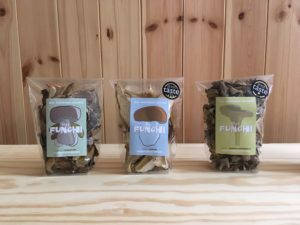 You can come and try our mushrooms when we make a return visit to lovely Chinley Cheese this Saturday for a wild mushroom tasting, from 9.30 – 12.30. 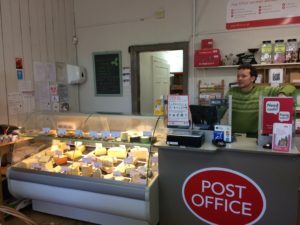 We were amazed last time we were there how many people came through the door to shop at this very popular deli that is also the Post Office. Everyone was greeted personally by Kieran the owner and it felt more like a community centre than a shop. I’m really delighted that both my sons are accomplished and enthusiastic cooks who truth be told have surpassed my skills in the kitchen department. I love getting picture messages of their latest creations but wouldn’t it be great if mobile phones included a transportation device so that a bowl of something delicious arrived on my table instead! 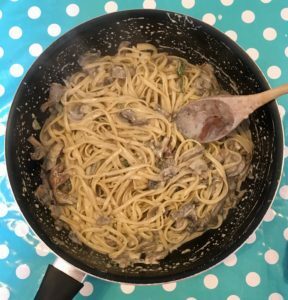 Joe’s Get Funghi porcini pasta – quick, easy and delicious. Put the dried porcini in warm water until just covered, and soak for 20-30 minutes until soft. Drain & keep the liquid. 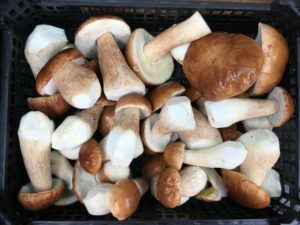 Fry the mushrooms in butter, add fresh mushrooms and herbs (thyme and or sage as desired), season & add a dash of Get Funghi porcini powder if you have any. Cook down for 5 minutes or so, add the soaking liquid and simmer to reduce, then stir in mascarpone. Serve with wide pasta like pappardelle and top with Parmesan or a similar hard cheese. Buon appetito!